Tis the season where the menswear fashion weeks wrap up, and every single blogger gives you their two cents about what we all just saw. Why does my opinion count over any one elses? Well I haven't decided that yet... but here's what I think. Now listen. The Jil Sander show gave us some serious leather, and I mean serious seriously. Who doesn't love a patent leather long sleeve? 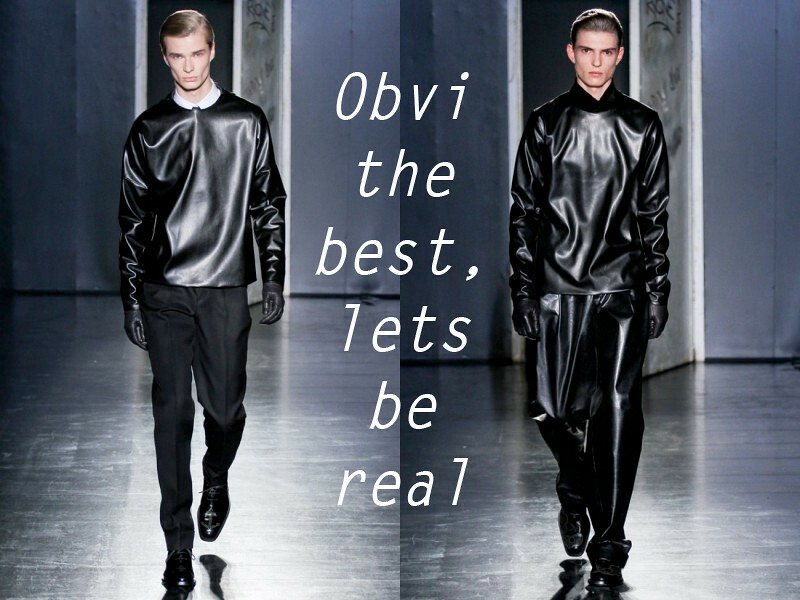 This show single-handedly shot "all leather everything" to the top of my list of looks I want to create/DIY. Lord knows everyone and their grandmother is going to DIY the leather lunchbag from this show but it won't be me. I'll leave that one for someone else to butcher. A DIY I might try is this metallic sweatshirt from the Neil Barrett show. Simple enough, but a great laying piece. Into it. I know, I know. 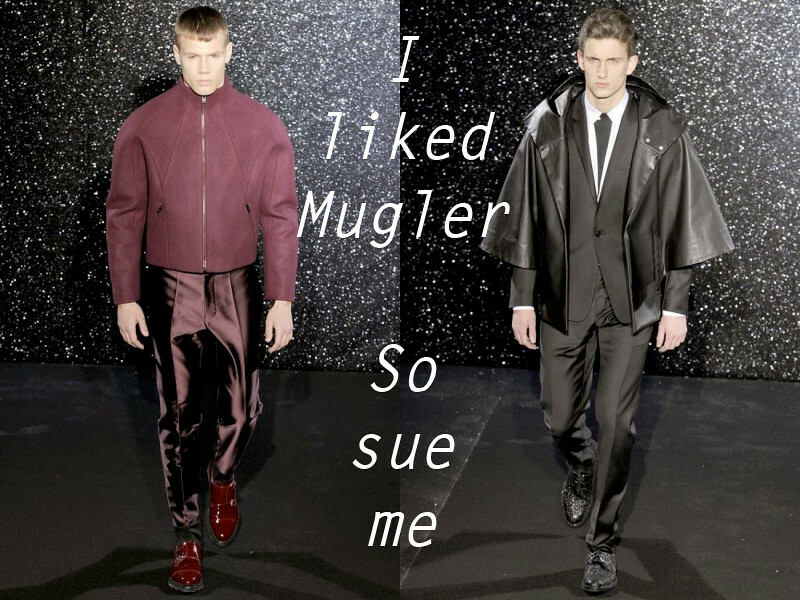 Nicola is ruining the Mugler name, blah blah blah. A step back from some of the ridiculous pieces in the show and I can honestly say I really like some of the silhouettes. Whatever. I don't have to justify myself to you, leave me alone!! 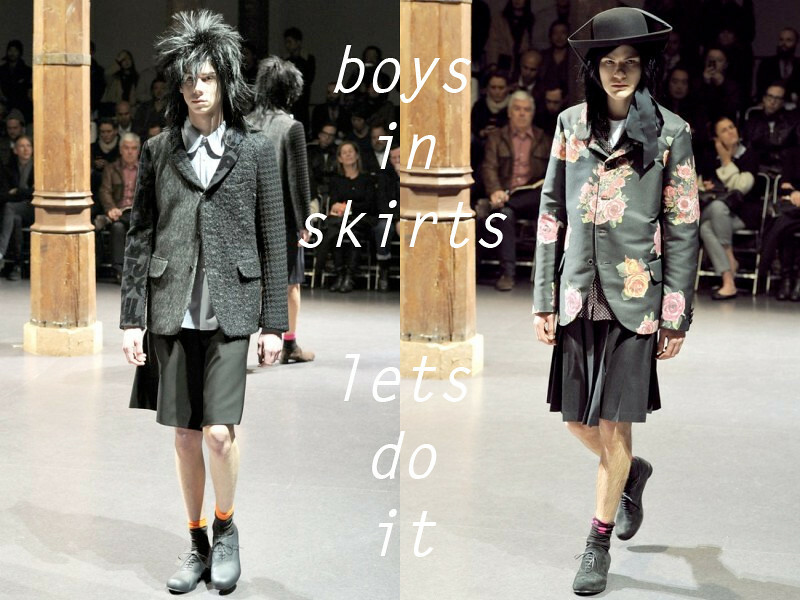 I've been super into kilts/skirts lately, and I was just waiiiiting for the Comme Des Garcons show, because I knew I could rely on the line for some skirts. Just knew it. Not feeling the Kristen Stewert hair, but I'll let that one pass. When looking at a show like Walter Van Beirendonck, you really need to take the show at face value. It will usually be ridiculous, it will usually be unwearable, but you need to find the pieces that can/would work. 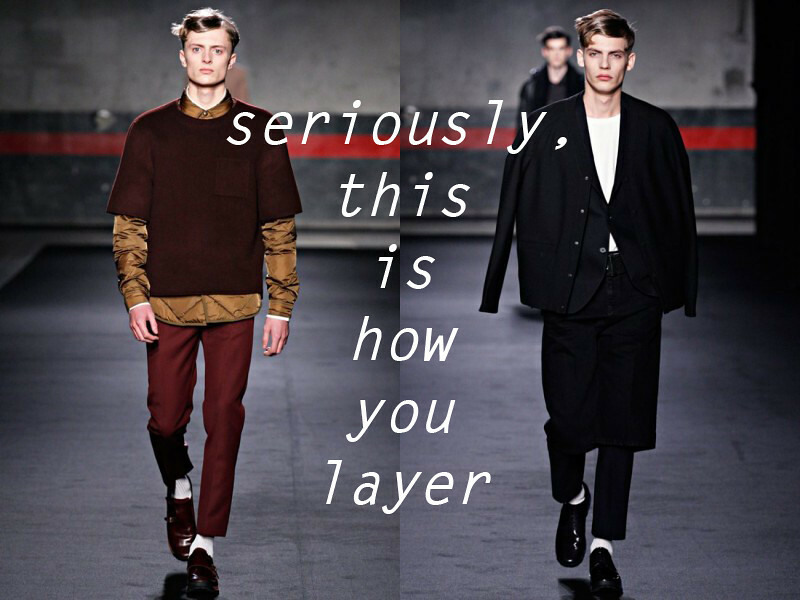 The monochromatic looks were the strong point of the show, and the multicolored layering was pretty genius. I'm a fan. I'm not going to pretend that the Raf Simons show was their best because, I mean... it wasn't. But daaaamn, I always love it. I can always point out about half of the line that I would kill to wear. 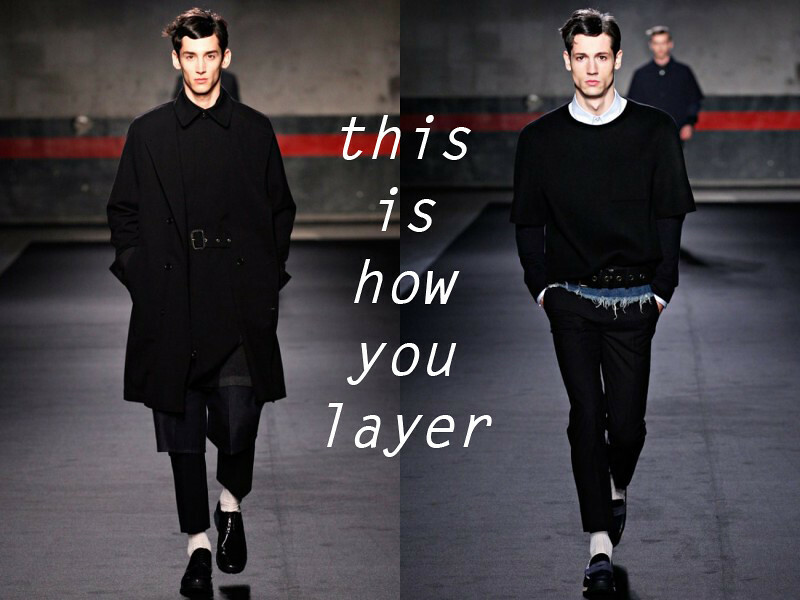 The stand outs for me were the mesh-like sweaters layered over a white shirt & black tie. Simple but awesome. Alright. 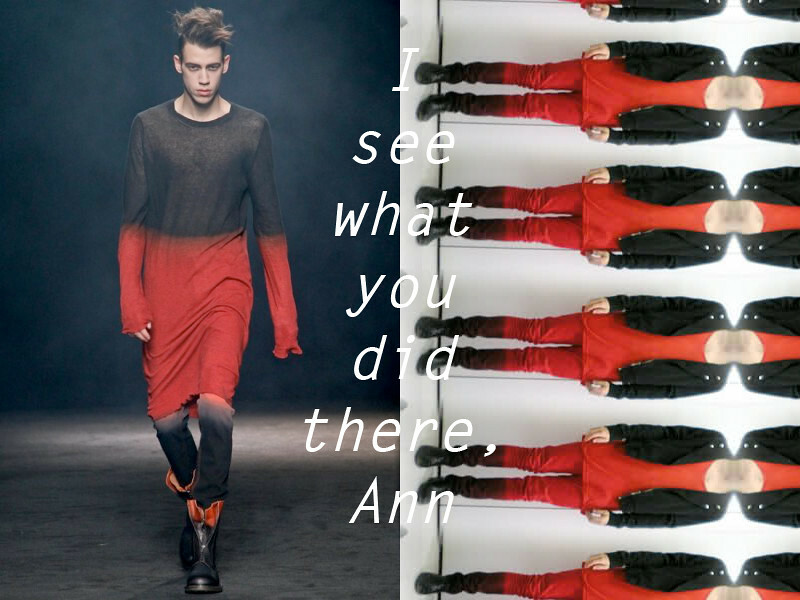 Person at Ann Demeulemeester who is lurking my DIYs and passing them along, make yourself known. Okay, obviously I know there isn't anyone over at the Ann team reading my little ol' blog, but damn this is a coincidence. Those of you ~long time readers~ may remember my DIY from April 2010 where I made these exact jeans. Haven't worn them much lately but maybe it's time to whip them out again! How did I nearly forget Juun.J?!!! Arguably my favorite line evvvver, I always look forward to this show. I think shoulders are the biggest trend to follow this season and Juun.J delivered simply the best in exaggerated. Love it. in all honesty, i think you should wear a Walter Van Beirendonck all the time. 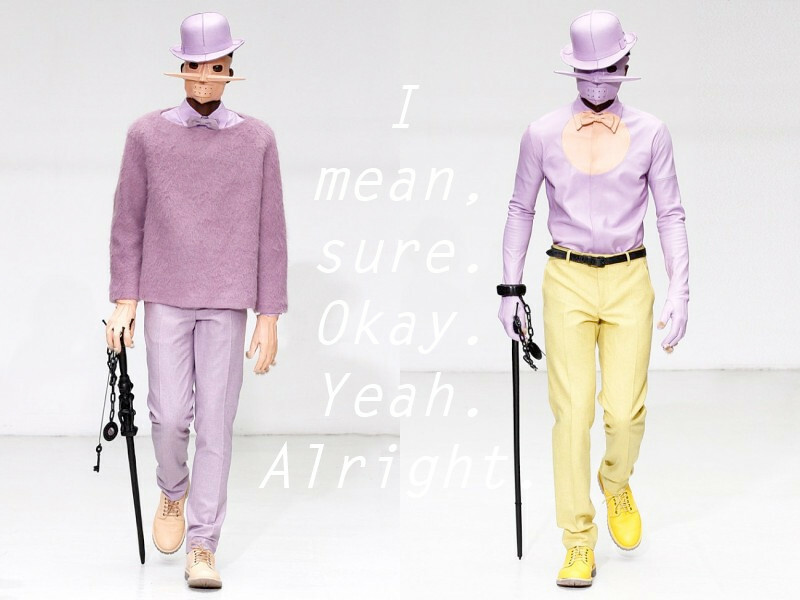 Those lavender pieces at Walter Van Beirendonck are amazing, we both really love that color right now! Also so obsessed with the rounded shoulders. 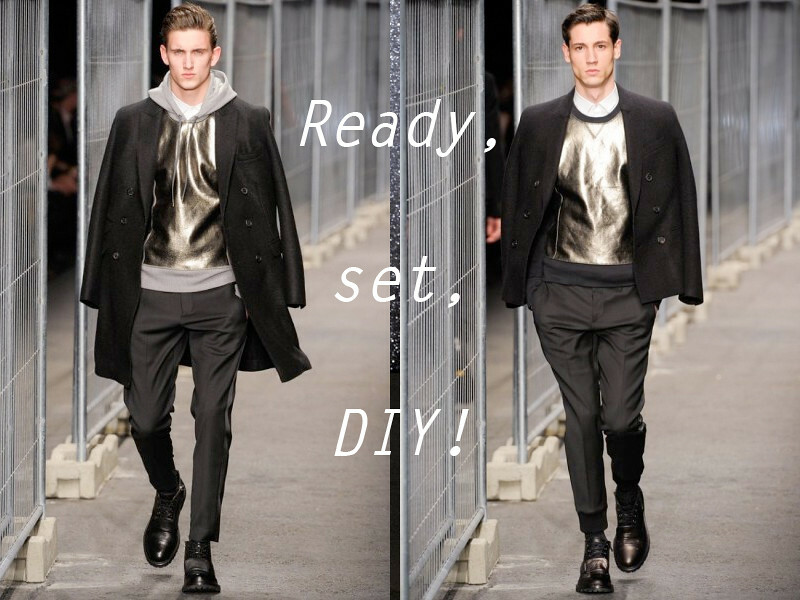 Definitely do the metallic shirt DIY, loved that piece from the Neil Barrett show! However ~obvious, we enjoyed this review! haha. ok i didn't type my comment out right... what i was trying to say is you are only allowed over to my house if you are wearing one of those masks. promise me. 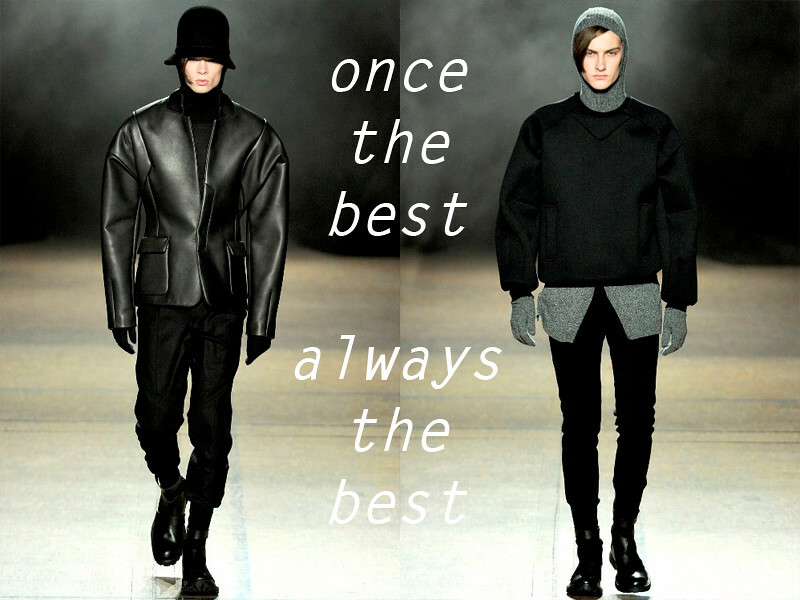 I completely agree with the Raf Simons sentiments, not his best, but always good. I thought WVB's was actually pretty wearable compared to his other stuff. Also, never. get. bored. of. boys. in. skirts. Love love love, your picks. 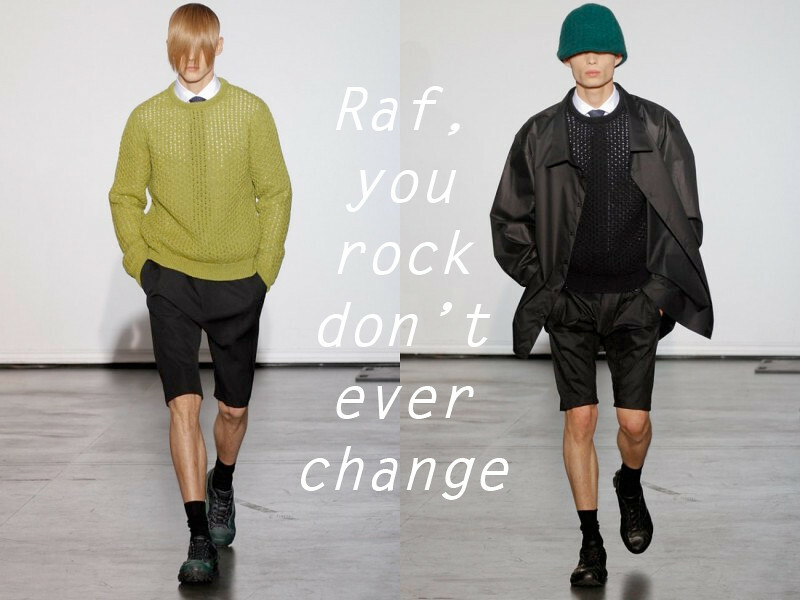 I'm obsessed with Raf and particularly the hot men in skirts look. Totally rad. Yes to all, DIY itching commence. How funny that Ann Demeulenmeester story!